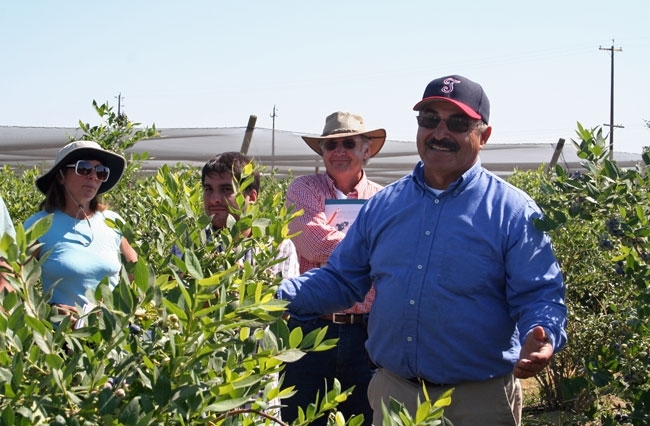 Manuel Jimenez, University of California Cooperative Extension advisor in Tulare County, hosted the annual spring blueberry open house at the UC Kearney Agricultural Research and Extension Center May 23. 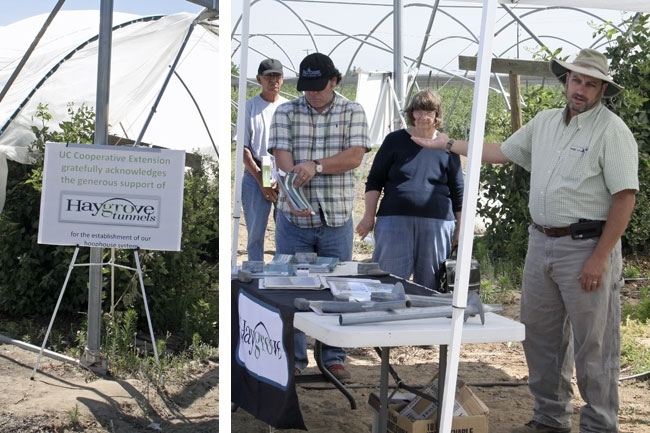 The event featured a tasting tour of dozens of blueberry varieties, review of an ongoing mulch variety trial, information about hoop houses and a first look at a new research project in which the most commonly grown commercial blueberries are grafted on a rootstock with greater tolerance for California's alkaline soils. 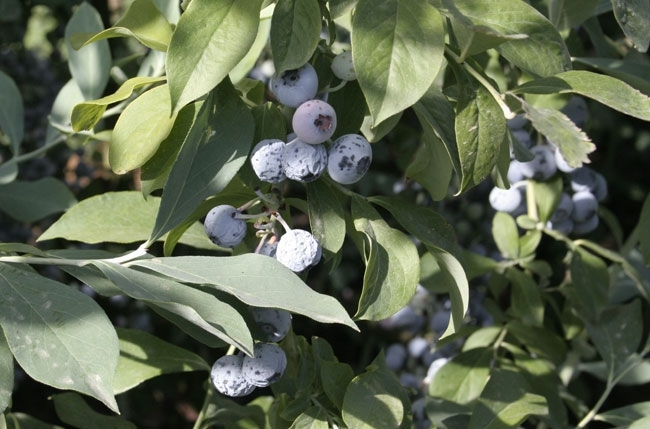 Read more about the blueberry rootstock trial on the UC Food Blog. 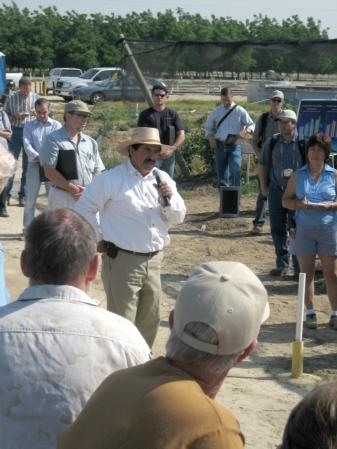 Manuel Jimenez leads a tour of the 15-year-old blueberry research plot. 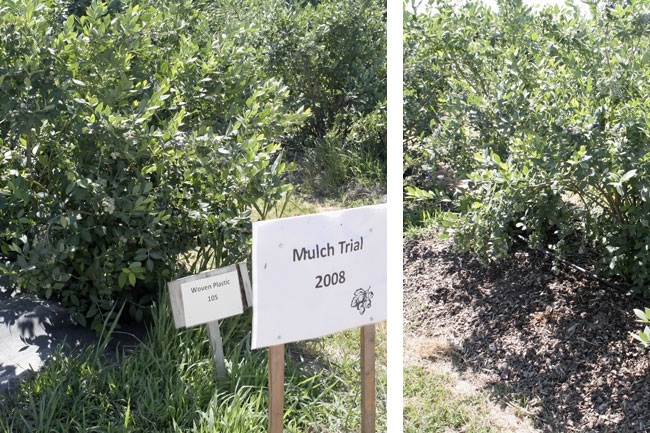 Two of the treatments in a blueberry mulch trial are woven plastic (left) and walk-on bark. Dominic Criscenti (far right), regional manager of Haygrove Tunnels, explains the product's versatility. The company donated tunnels for research at Kearney. 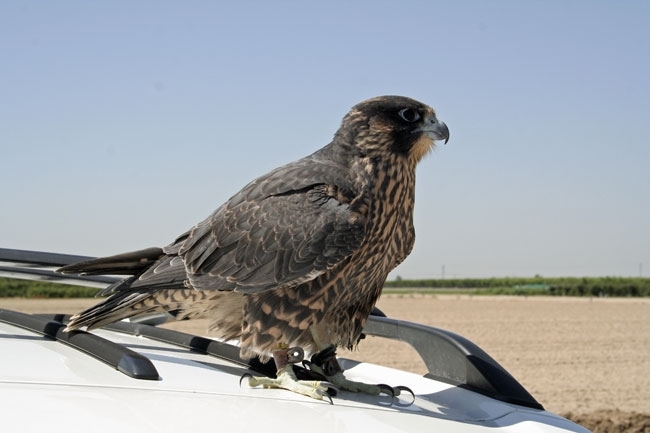 A two-month-old falcon demonstrated biological bird control at the blueberry open house. Some people say rabbiteye blueberries get their nickname from the circle on the blossom end the fruit. Others say the fruit's tendency to turn pink before going blue is reminiscent of a rabbit's eye. 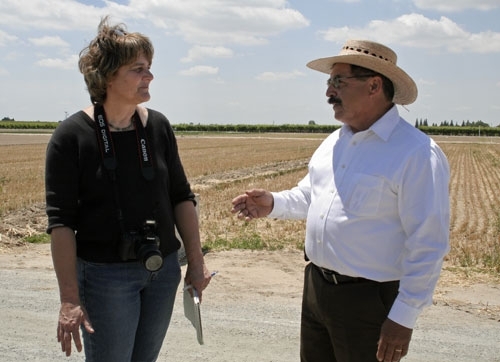 Whatever the reason, late ripening rabbiteye blueberries can provide San Joaquin Valley growers the ability to harvest fruit through the end of August, capturing a potentially lucrative market window, says UC Cooperative Extension farm advisor Manuel Jimenez. The rabbiteye blueberry variety Rahi. Jimenez hosted blueberry growers at the Kearney Agricultural Research and Extension Center today to test the taste and texture of late-season blueberries. The participants also saw Jimenez demonstrate proper pruning techniques and had the opportunity to practice pruning on blueberry plants in Jimenez' test plots. 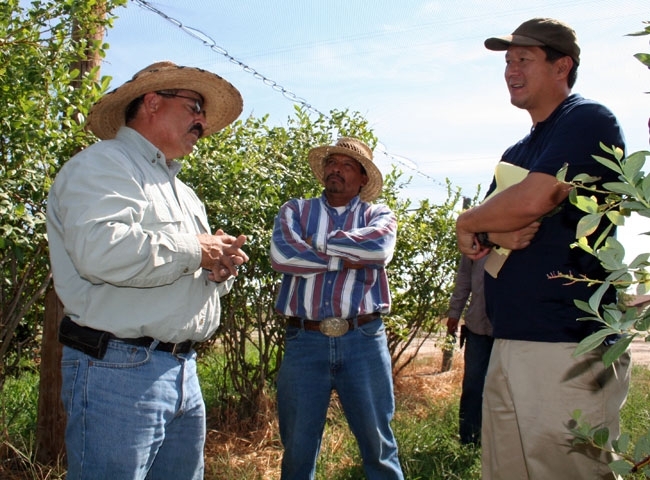 Porterville blueberry farmer Young Kwun attended the meeting with his farm manager Miguel Jaramillo Garcia. Kwun asked Jimenez how to replant blueberry bushes that had died. "You can't do it," Jimenez replied. In the test plots, Jimenez and his staff replanted 60 blueberry bushes, and none of them survived. He tried a second time with the same result, and then inquired with blueberry growers around the country, finding that they also could not replant blueberries. 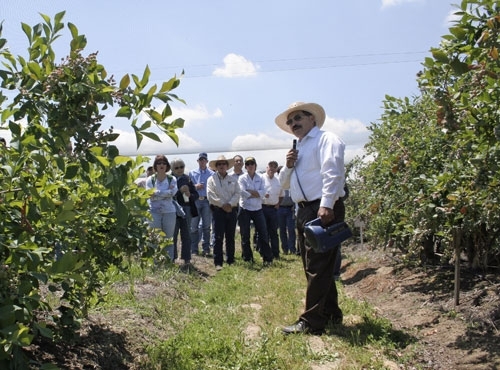 "Replanting is an issue with blueberries," Jimenez said. "We don't know what it is." "You just saved me a bunch of money," said Kwun, whose 70-acre farm has a number of blank spots. Kwun said he has missed the last few blueberry field days at Kearney, but that won't happen again. "I'm thinking I should come every year," Kwun said. "I learned a lot." Manuel Jimenez, left, speaks with farmers Miguel Jaramillo Garcia and Young Kwun. Growers gather in the KARE blueberry test plot, which was established 11 years ago. The "Powder Blue" rabbiteye blueberry tends to shrivel in the hot August sun. Field day participants practice pruning skills. 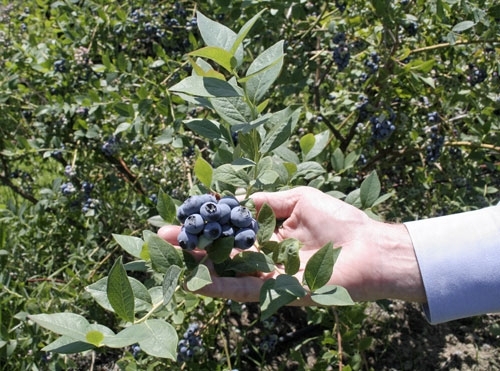 Using and documenting good agricultural practices in the blueberry plot at KARE in recent years will save the research station’s environmental health and safety staff a significant amount of time. 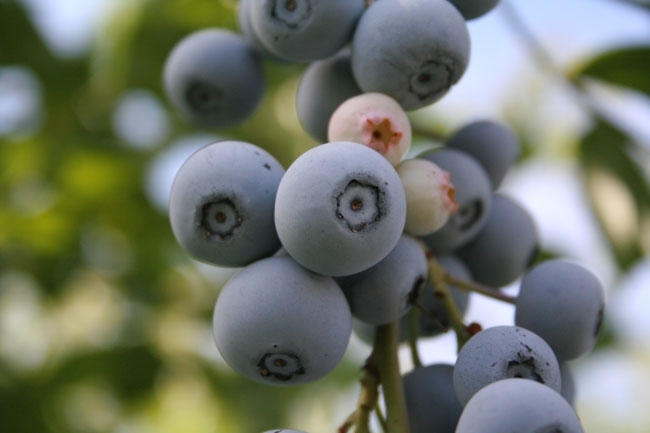 Driscoll, the berry marketing company that ships Kearney’s blueberry crop to national markets, audits KARE and all of its producers to document their agricultural practices to ensure the crop’s wholesomeness. 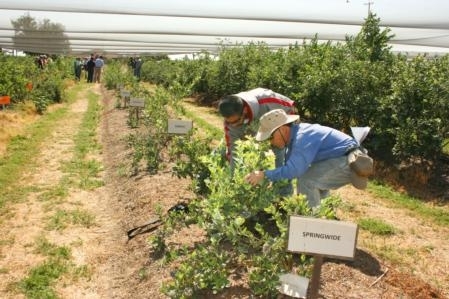 The audit, performed by the independent third party Primus, requires extensive documentation – including such details as inspection of field worker sanitation facilities and hygiene training, pre-harvest fruit sampling and laboratory testing for pesticide residues, records of worker safety training, employing expert pest control advisers using IPM practices performed by certified applicators, even the number of tractor hours involved in production, when the tractor oil was last changed and how the old oil was disposed. The report also documents details about crop inputs, such as pesticides used, the calibration of spray rigs, etc. “This year because of a three-year history of more than 97 percent assurance in Global Food Safety requirements, we are not required to spend the many hours required in a full audit, submitting documentation and lengthy inspections to meet the standards,” said Alan Cary, the KARE safety coordinator. Cary estimates this year’s exemption from documentation will save 40 hours of labor. “I want to thank KARE’s farm operation staff for their support in continuously exceeding food safety requirements for products that are harvested and shipped from KARE to consumers around the globe,” Cary said. The 3.61-acre blueberry plot at KARE is a research planting for UC Cooperative Extension farm advisor Manuel Jimenez. 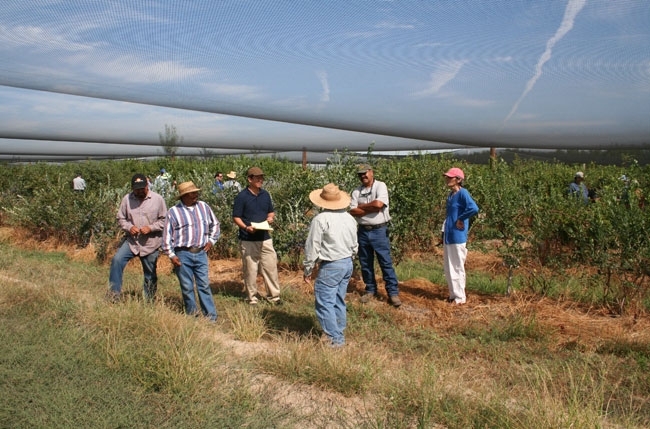 The plot provides not only valuable science-based information for California’s blueberry farmers and industry, but also some crop income to help offset the research costs.